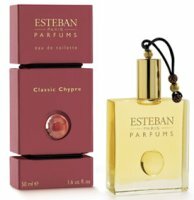 Next month, Esteban will introduce Collection Chypres, comprising two new fragrances in the chypre fragrance category. Classic Chypre (shown) is "like an intense presence of rare elegance… A chypre harmony or an aromatic hesperidean surge opening up onto a spicy floral heart on a woody patchouli-moss base". Additional notes include bergamot, basil, jasmine, rose and vanilla. Classic Chypre was developed by perfumer Norbert Bijaoui. Modern Chypre was developed by perfumer Fabrice Pellegrin, and is "like a delicious version of a legendary perfume… Sparkling modernity of citrus-fruity notes with a delicate floral heart sustained by an amazing rich patchouli base". The notes include bergamot, green mandarin, raspberry, lily of the valley, white rose and praline. Other recent releases from Opus Oils: Roller Girl. Don't tell me they actually meant 'Chypre' and not 'Cypher' on that blurb? hoo boy. I hope that release note wasn't sent out to everyone like that. I like the sound of the Estebans though I'm familiar only with their home scents. Love their cedar one. Um, is that Monica Lewinski (apologies if spelt incorrectly) in the Fire Tassels? The mind boggles…… though infinitely preferable to the recent P Diddy/Tom Ford stuff. LOL — I didn't even notice it.Just added “sic”. Well, hey, they are a little indie company, I've seen worse from much larger perfume houses. I like Esteban's Sensuelle Russie, but haven't gotten around to reviewing it yet. There are quite a few in the line that I've never tried. Hey — she does have ML's hair! Or the other way around, I guess, since CeCe Walker came first. I like the name Satan's Angel. I love the name Satan's Angel too – I have a bit of a soft spot for anything kitschy, burlesque included. I have smelled one Esteban – they have a nice Peony fragrance. These chypres sound nice as long as they're not too heavy on the patchouli. Thanks, will have to look for the peony. Don't think I've ever found a really great peony fragrance.